Kris Aquino in an emotional state read their statement in an interview with Korina Sanchez. Friends of the former President Aquino like Senator Franklin Drilon and Mayor Alfredo Lim cried as they told their heart-warming message to the former President. The Aquino family wants the medical condition of the former President to be in private. They did not even release the stage of the former President’s cancer. We would just have to wait for the next medical bulletin from the Aquino family. Her mild chemotherapy would start today. 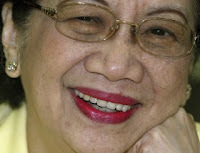 My prayers for Cory Aquino and her family. how is she now? healthier? I hope so..